Back at Sheridan Beach Resort & Spa, after our organic farm tour and lunch, we returned to our respective rooms to freshen up and prepare for our next resort-sponsored activity – the Sabang X Zipline. After 15 mins., we all met up at the beach in front of the resort and boarded a Xibeihu Amphibious Boat (one of two the resort has) that would take us, on a bumpy ride through Sabang’s resorts, all the way to the mouth of the Sabang River. Upon arrival, we all alighted our vehicle and boarded a bamboo raft that would take us to the river’s other bank. The crossing just took us a little over a minute. Once across, we hiked for about 15 mins. along a beautiful, thickly forested and clean white sand beach. At the end of the shoreline is the entrance to the zipline park. From here, it’s a “short” ” (10-30 minutes, depending on your stamina) uphill trek, along the narrow but well-maintained Monkey Trail through a forest, to the zipline platform tower at the top of the headland located 150 ft. above sea level. Stepping stones and wooded stairs made the not-so-steep trek easy and there were benches along the path where you can rest. The equipment used (oval locking carabiners, trolley, etc.) were reliable French-made Petzl. Joy took first crack at it, followed by Charmie, yours truly, PJ and Lester bringing up the rear. The view from the 800 m. (almost ½ mile) long zipline, one of the longest in the Philippines and one of three (the others are the Palawan Rancho Zipline and the Irawan Canopy Zipline) in Palawan, is amazing. The gentle, one-and-a-half minute ride was not too fast, giving me some time to enjoy the spectacular, 360 degree view of the pristine blue waters of the West Philippine Sea, mountains and whole of Sabang Beach. What more can you ask for. However, while going down the zipline, it was a bit challenging to turn on the other side. Wooden brake blocks, at the end of the line, helped slow and finally stop my zipline trolley. There was a photographer on both ends taking our pictures. One hard copy souvenir picture costs PhP150. The landing hut is located beneath a monolith on an island whose rocks seemed like collapsed decks piled one on top of the other. It is connected to the mainland via a sandbar. The Puerto Princesa experience wouldn’t be complete without trying this. SabangX Zipline: Sitio Sabang, Brgy. Cabayugan, Puerto Princesa City, Palawan. Ticket Office: Sabang Wharf and La Terrasse, Rizal Ave., Puerto Princesa City. Tel: (048) 723-3401 and (048) 434-2341. Website: www.sabangxzipline.con. E-mail: sabangxzipline@gmail.com. Fee: PhP550/pax. An additional PhP200 is charged for the Superman position ride. Open 9 AM – 4 PM. After our delightful Loboc River Cruise, we all returned to our airconditioned coaster for the highlight of our Bohol Countryside Tour – the Chocolate Hills Adventure Park (CHAPS) which is owned and run by Camanayon Hill Development Corp. Situated in Carmen, it is the latest eco-tourism and adrenaline pumping adventure park in Bohol. The sprawling 4-hectare park offers thrilling adventure activities like hiking trails, tree top adventures and the famous, exciting and very unique bike zip line dubbed as “The Rush.” The 37-km. drive, via the Loay Interior Rd., took about 40 mins. and we arrive at CHAPS by 4 PM. From the park entrance, we first crossed a short wooden bridge, over a natural pond, to a main receiving hall that houses the reception desk in the middle, a small open-air restaurant (Cuisina ni Tesai) offering Boholano dishes plus some souvenir stalls on the left and an events place on the right. Here, Josue took a head count on those who would avail of the adventure packages. However, Joy, Czarina, Julia, Lara and yours truly were here for “The Rush” – the bike zip which takes biking to another level. From the pavilion, we all hiked along a wooden boardwalk that meanders over a brook. Along the hiking trail, we passed by a serpentarium that houses a few snakes (python, green Oriental whip snake, etc.) found around the area during the construction of the park plus some sugar gliders and hedgehogs. We made a stopover at a cottage where a nurse checked our blood pressure (mine was 140/90). Lara had to back out for reasons I will not divulge. We were also given a briefing on what to expect on the bike zip. After climbing all 268 steps (including crossing a hanging bridge 4 at a time) along the hiking trail, we were already a little out of breath when we reached the viewing deck. Since the massive magnitude 7.2 earthquake of October 15, 2013 destroyed parts of the old viewing deck (as well as a few of the 1,776 Chocolate Hills) in the town of Carmen, the one at CHAP’s became the de facto viewing deck (the hills are much farther away though) while the old one, which has a much grander view, is being rebuilt. The Bike Zip is a 275-m. (550 m. round trip) long zip line, 150 ft. above the ground, using a mountain bike to cross from one hill to another. After all suiting up with helmet, harness and hairnet (? ), we all climbed the stairs going up to the tower. The bicycle, minus the rubber tires, is securely joined to the zip line so there’s no problem balancing. All we had to do was pedal and feel the ride. I was supposed to go first and I was already mounted on the bike and ready to go when I suddenly got chills and almost chickened out. I have somehow conquered my fear of heights, having gone ziplining a number of times, but seeing how high I was from the ground, the scenario seeing the hills high up in the sky made me shudder. I allowed Joy to have first crack at it and, as soon as she made it to the other side, I gathered the courage and followed suit. The ride was scary at first as I had this feeling that, at any moment, my bike would fall off from the zip line. It took some time to for me to feel at ease with the ride but, once I got the feel for it, the ride slowly became enjoyable and exciting. The ride truly gave me a different experience of seeing the famous Chocolate Hills. They say that the windier and rainier it is, the more exciting the bike ride is. Due to the rush of emotions, now I know why they call it “The Rush.” It was truly an exciting, one-of-a-kind experience. After Joy and I, Czarina and Julia followed our lead. After our bike zip, we interviewed Mr. Jing E. Velaso, Managing Director of CHAP on the parks’s current facilities and future plans (including overnight accommodations). The park has a 9-course rope challenge adventure course – “Islands in the Sky,” “Burma Loops,” “Burma Planks,” “Hanging Bridge” (2 stages), “Earthquake,” “Vine Walk,” “Jacob’s Walk,” “Tyrolean” and the “Zipline.” You get to “Zipline” upon completing half of the course and then the “Ttyrolean” traverse for the rest of the course. Upon completion of all courses, you rappel your way down. These trails test one’s strength, balance, endurance, strategy and patience. Rates: The Rush (Bike Zip): PhP400, The Snake Ladder (Tree Top RCA): PhP200, The Pentagon (Tree Top RCB): PhP350, Gymnaskids (Child Rope Course): PhP300, Eco-Hiking Trail: PhP200,Chicken & Fish Feeding: PhP50. Chocolate Hills Adventure Park (CHAP): Sitio Camanayon, Brgy. Buenos Aires, Carmen, Bohol. Mobile number: (0917) 304-1341 and (0932) 667-7098. Email: chocolatehills_adventurepark@yahoo.com. Entrance Fee: PhP60. Open daily, 8:30 AM – 5:30 PM. How to Get There: CHAPS can be reached in an hour and a half by riding a bus or van from Dao Terminal in Tagbilaran City. After checking out at the Quezon Premier Hotel, Mel, Rannie, Angela, Maichel and I drove out to Ouan’s The Farm Resort, , a popular choice of visitors to Lucena City, whether for business or pleasure, exploring or just passing through. Here, the thrills of a complete family resort are combined with the simple, laid back life on the farm, with its butterfly haven, fish pond, goats, chickens, fruit-bearing trees, lush vegetation and fresh air. Upon arrival at the reception area, we were welcomed by resort Gen. Manager Ma. Louchiel S. Labay who prepared for us a breakfast of pancit habhab, chicken empanada, fresh buco and pandan juice. Also on hand was travel/tourism consultant Ms. Lurhen T. Cortes, Gen. Manager of Appsline Travel Services & Consultancy, who was to tour us around Pagbilao town. After breakfast, Lurhen and some of the resort staff toured us around the grounds. The resort has overnight accommodations (standard rooms, suites, dorms) and a number of swimming pools ranging from Olympic size, to free form and kiddie pools. It also has a coffee shop (Grandma’s Kitchen); cozy and spacious conference rooms and function halls; a firing range; tennis court; basketball/volleyball court, camp site; sauna and football field. Of particular interest to us was their wall climbing, rappelling and zipline facility and everybody proceeded there. My four companions decided to try out all 3 activities while I, with my bum knees, just watched from the sidelines. Louchiel’s daughter also joined them on the single pulley zipline. Once on the other side, they then climbed another tower and zipped back to the starting point. Maichel and Angela also successfully climbed up and rappelled down the climbing wall. Mel only did the latter while Rannie tried and failed on the former. Back at the reception area and prior to leaving, Louchiel also introduced to us their new product – milkfish (bangus) sardines. These fish are cooked in a pressure cooker so that the bones become so tender they can be eaten. Louchiel also introduced us to her father, retired PNP Chief (during the Ramos administration) Dir.-Gen. Recaredo A. Sarmiento II (PMA Class 1966), who is from Buenavista in Marinduque. His father and namesake was Buenavista’s longest serving mayor. A proponent of modern farming, he was once a provincial agriculture program consultant in Marinduque. Back at the farm, he tends to his tree plantation, notably his duku and longkong lanzones trees. Ouan’s The Farm Resort: Km 133 Diversion Road, Kanlurang Mayao, Lucena City 4301, Quezon. Tel: (042) 710-4552 and (042) 373-4728. Mobile numbers: (0923) 744-4181 and (0923) 749-4333. E-mail: ouansfarm@yahoo.com. Website: www.ouansthefarmresort.com. Appsline Travel Services and Consultancy: Phase 2, Krisanta Village, Brgy. Bukal, Maharlika Village, Pagbilao, Quezon. Tel: (042) 716-0067. Mobile number: (0922) 633-0363 (Ms. Lurhen T. Cortes). E-mail: yvette_24@yahoo.com andappsline0305@gmail.com. Jandy and I left our group to join 5 students (4 ladies, including a Korean, and a lone guy) of UP Visayas (Miag-ao, Iloilo) who were going to try out ziplining at the Tibiao Eco-Adventure (TEA) Park, so we decided to join them when they do. All seven of us were dropped off by our van driver at the park entrance, beside the uphill road leading to Kayak Inn. Opposite the park entrance, across the road, is their Fear Buster Tower, seemingly a wall climbing facility. The TEA Park is noted for its two 1-km. long ziplines, said to be the longest in the whole of Panay Island. Aside from wall climbing and ziplining, the park also offered river kayaking but their kayaks were all damaged on the boulder-strewn Tibiao River and one could be seen hanging by the booth. 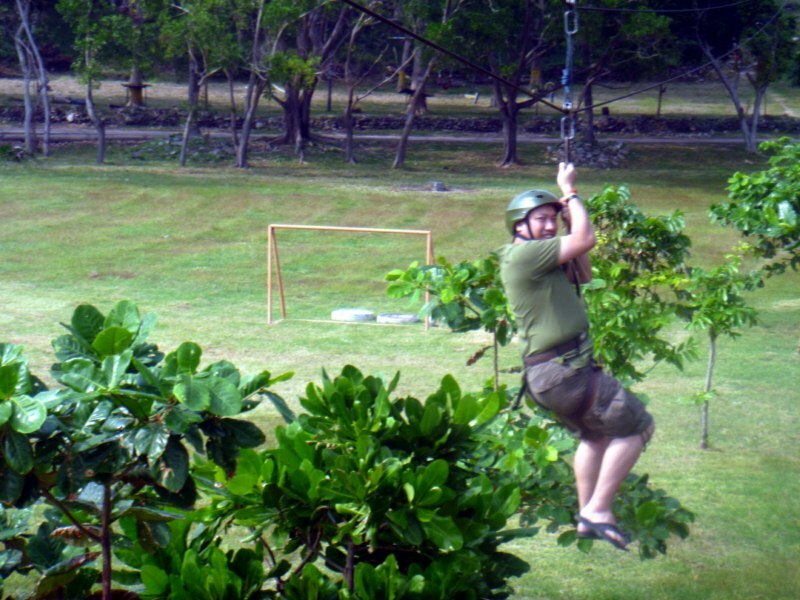 This would be Jandy’s second try at a zipline (the first was in Corregidor Island) and I can’t remember how many times I’ve tried it. From what I see, it would be the first for the students so I let all of them suit up and have their first crack at it. After all five have finished with their run, it was Jandy’s turn on the line, with me the last to go. The nearly 45 second adrenalin rush traversed great views of the valley, lush forests and the beautiful Tibiao River flanked by some nice rice terraces. Once on the other side with Jandy, we had to go up steps carved on a hill to get the next jump-off point, another steel tower set on a raised platform, for the zipline ride back to our initial staging point. Tibiao Eco-Adventure (TEA) Park: Butong, Brgy. Tuno, Tibiao, Antique. Zipline Rate: PhP300/pax. After breakfast at La Playa Restaurant, we all weighed the activity options available for us on the island and they had quite a few – ziplining, ATV (All-Terrain Vehicles), swimming (beach or swimming pool), hiking and sea kayaking. We opted to try the first two. A ride at the ROCKet Zipline, a first for everyone except me (I’ve tried it twice before in previous visits to the island) would set us back PhP100 each. The zipline system actually originated in Europe and and was used to cross mountain ranges. We proceeded to the zipline’s jump-off point, 40-ft. high, amphitheater-like ravine just outside the Corregidor Inn. I took first crack at it, donning a seat harness which was strapped around the waist and thighs, then was clipped into a double-pulley system with a backup line. Once suited up, I walked to the edge where I stood on a raised platform then was unceremoniously shoved down the 655-ft. long free-fall cable line. Propelled by gravity, I literally flew through the air, so to speak, as I sped past nearby trees, spreading my arms wide and turning around to face the sea, as I was cheered on by my family. Near the end, 2 brakes slow down your travel as I approached the 16-ft. high receiving platform at South Beach where a guide assisted me in getting off the zip-line system. Then it was Grace’s turn to try out this 25-second adrenaline rush which traversed just about half of the narrowest point of the island. She was followed by Marve, Cheska and, lastly, Jandy. Truly a nice, first-time experience for all of them. I wished it were a longer ride but this was not possible, as I would end up in the sea. It just so happened that the receiving platform at South Beach was conveniently located beside the parking area for the ATVs. There were 10 4-wheeled, off-road ATVs for us to rent (at PhP500/hr. or PhP300 for 30 mins.). We picked out two ATVs and Cheska and Marve took first crack at it. But first, they had to don helmets, knee guards and elbow guards plus listen to our guide as he instructed us on how to use it. Soon, both were off to the man-made, winding and bumpy dirt track especially blazed through the grassy field for that purpose. Grace took over from Cheska followed by Jandy while I took over from Marve. It all fun, especially for Jandy who rode the longest. It was my second time to ride an ATV, but I was still wary driving it over rocks, thinking I would topple over. We soon had our fill after nearly an hour and we were already hungry, so we hied off back to La Playa Restaurant where we had a very late lunch. Sun Cruises, Inc. (SCI) – Reservation Office: CCP Terminal A, CCP Complex, Roxas Blvd., Manila. Tel: (632) 831-8140 and (632) 834-6857 to 58. Fax: (632) 834-1523. E-mail: suncruises@magsaysay.com.ph. Sun Cruises, Inc. (SCI) – Sales Office: 21/F, Times Plaza Bldg., Ermita, Manila. Tel: (632) 527-5555 local 4511 and 4512. Fax: (632) 527-5555 local 4513. E-mail: sales@suncruises.com.ph. From Daraga, I made a short stopover at Embarcadero de Legaspi, a major waterfront development fronting the Legaspi City‘s main harbor. Bernard and I previously had an evening coffee here 3 days before. The mall is just a short jeepney ride from the Governor’s Mansion (where we stayed overnight). Located on a 15.477-hectare property on reclaimed land, Embarcadero sits at the foot of Kapuntukan Hill (Sleeping Lion Hill). Owned and managed by Embarcadero Land Ventures, Inc., it is now the Bicol Region’s premier urban mall and shopping center. This world-class lifestyle hub for tourists and locals is home to retail spaces, restaurants, markets, a host of branded specialty boutiques, a major civic space (Embarcadero Celebration Plaza), a supermarket (Puregold), a classy hotel (Ellis Ecotel), themed indoor amusement center (Playland) and a bowling alley. Its picturesque, landmark lighthouse, with its beaming searchlight, doubles as the office of the city’s 91.5 Magik radio station. The seaside area, a favorite hangout place (the mall stays open until midnight), has a host of open-air paluto restaurants where one can sample the freshest seafoods, the well-known Bicol Express and mouth-watering laing, all while sipping a bottle of cold beer, watching the ships’ lights and listening to a live acoustic band. Embarcadero de Legaspi: Port Area, Victory Village, Legaspi City, Albay. Tel: (052) 481-1000. Rides to Embarcadero de Legaspi, via brightly-colored, eco-friendly electronic E-jeepneys and E-tricycles, are available at the Battle of Legaspi Monument. There’s also a free shuttle inside the mall. After an early morning breakfast at Villa Isabel Hotel’s restaurant, I packed up for my trip back to Legaspi City where I was to take the 1:20 PM Zest Air flight back to Manila. Bernard stayed behind as he had other business to attend to in Sorsogon City. I took a tricycle to the national highway where I boarded a Legaspi City-bound van which left by 8:30 AM. I arrived at the Legaspi City Satellite Bus Terminal by 10 AM. Here, I was picked by Ms. Danica Pontejos, a staffer from Mr. Marti Calleja’s Bicol Adventures, and her driver. As it was still early in the morning, I still had 2 hrs. to tour the city and Daraga town prior to being brought to the airport and Marti was kind enough to let me do so. First in my itinerary was, fitfully, the Lignon (pronounced as lin-yon) Hill Nature Park, one of the city’s famous landmarks and the highest location in the downtown area. The trip up the paved zigzag road of the 156-m. high hill took less than 10 mins. (the hike up takes 45 mins. to an hour). For years, the hill was known for its PHIVOLCS observatory at its southwestern slope and the old lighthouse at its summit. Today, it is known for its view deck where I had a panoramic, 360-degree view of Legaspi City (and its airport runway, 11 kms. southeast of the volcano’s summit), Daraga and Albay Gulf. Best of all, as it was early in the morning (the best time to visit), I had a spectacular view of the world famous Mayon Volcano and its breathtaking perfect cone in all its naked glory. During my first visit to the city almost 7 years ago (http://firingyourimagination.blogspot.com/2005/07/albay-mayon-volcano.html), my afternoon view of the volcano was shielded by swirling clouds. In the late afternoon, you can watch the sunset and, in the evening, the city lights of Legaspi. For sightseers and guests, the hill also has a landscaped promenade with restaurants and shops. For the adventurous, there’s also a 320-m. long zip line where one can soar through the air harnessed to a cable. Other adventure activities and extreme sports offered include hiking, mountain biking (on the gullies at the foot of Mt. Mayon), rappelling 150 ft. down, paintball, riding 4-wheel all terrain vehicles (ATVs, c/o Your Brother Travel and Tours) and, soon, airsoft. You can also take the super steep route up the hill via the Kapit Tuko Trail or explore a 50 ft. long Japanese tunnel. Lignon Hill Nature Park: off Binitayan Rd. (behind Albay Park & Wildlife). Open daily, 8 AM-11 PM. Admission: PhP10 (educational tour rate) and PhP20 (foreign visitors and non-Albay residents), 5- 9 AM free of charge for regular joggers. Zipline off season rates: PhP250 (basic) and PhP350 (advanced – superman). Rappelling rates: PhP200 (off season) and PhP250 (peak season). Your Brother Travel and Tours: ATV rates: PhP1,800/hour (150cc) and PhP2,500/hour (500cc or buggy). Tel: (052) 820-3629. E-mail: yourbrothertravevandtours@yahoo.com. We were now in Lakbay Tour’s second day and, after an art-filled first day in Baguio City, we were now in for some adrenalin pumping adventure featuring zip lines (3 to be exact) with some all-terrain vehicle (ATV) excitement thrown in at Pugad Pugo Adventure Park in Pugo, La Union. Pugad, “bird’s nest” in the vernacular, is actually a hybrid of the two words Pugo, the name of the town, and “adventure.” We alighted from our special Victory Liner tour bus (its body sticker-wrapped with the tour’s sponsors), at the Flying V (incidentally also a Lakbay Norte 2 tour sponsor) station along Marcos Highway in Brgy. Cares in Pugo and transferred to a smaller Pugad shuttle bus. DOT Region 1 representatives Evangeline M. Dadat (senior tourism operations officer) and Reynaldo Gesmundo (tourism operations officer II) joined us. After a 300 m. drive over a narrow road (unfit for our big bus), we finally arrived at the resort. Though this inland swimming resort has 2 crystal-clear outdoor swimming pools (adult and kiddie), picnic cottages, clean toilets, shower rooms, conference halls and a hanging bridge over a clean river, Pugad Resort is more known for the extreme adventure it offers. Pugad’s famous 380-m. long and 240-ft. high Super Man Zip Line 1, one of the resort’s three zip lines, stands out as the longest zip line in Luzon and is reportedly the second longest in the country. Rates for the 3 zip lines is PhP900 per person or PhP1,000 if it includes wall climbing and breathtaking rappelling.This was too good to miss out. But first we had to wait in line as only five people can be accommodated at a time. While waiting, we opted to try out out the 4-wheel, all-terrain vehicles and dune buggies at the nearby dirt track. Unlike the zip line, this was a first for me and I drove cautiously over the winding and hilly but well-designed, 2.5-km. long course with its numerous bumps and turns, at one time falling into a ditch in spite of my caution. My other companions confidently drove like seasoned racers. However, I soon speeded up midway round the course, only slowing down as I tackled the final 4-ft. high and steep hill back to our starting point. This initial adrenalin rush now over, it was now time for some state-of-the-art zip lining. There were no more waiting lines as only three of us were left, the other two being Studio 23’s Hannah Barrios and Joshua “Red” Nietes, both reluctant and scared first-timers. After filling up the necessary waiver forms, we were suited up with the necessary Petzl C29 Pandion harness and Petzl helmets for our safety then bundled into the back of a pickup truck, then driven up the cliff, We then made a short hike, up a concrete stairs, to our first zip line—the Super Man Zip Line 1 (so named because we had to do it in a flying Superman pose), the highest and the longest in duration (30 seconds) of the three. Pugad Pugo Adventure Park: Sitio Kagaling, Brgy. Palina. Mobile number (0927) 667-2619. Tel: (072) 603-1592. E-mail: pugoadventure@yahoo.com. Come morning, prior to breakfast, Lee and Mark opted to do some fishing as South Dock. The fish that early morning weren’t biting and the only thing they had to show for their unsuccessful effort was a lost fish hook. After a hearty and filling breakfast, Mark and I, with other hotel and day tour guests, joined the regular tour via tranvia. Its itinerary included Batteries Hearns, Geary, Way and Crockett, plus the Pacific War Memorial (and its museum), Lorcha Dock and the Spanish Lighthouse. Battery Hearns, a 12-inch seacoast gun, was built from 1918 to 1921 at a cost of US$148,105. One of the last major additions to Corregidor’s defense system, it had a maximum range of 29,000 yards and was capable of firing in all directions. Intended to defend the island against enemy naval threat from the South China Sea, Battery Hearns had been in action firing towards Cavite from February 1942 and, on April 8 and 9, 1942, towards Bataan. When Corregidor fell, this gun emplacement was captured nearly intact by the Japanese. It was subsequently repaired and put back into action. However, in January and February of 1945, it was completely neutralized by American aerial bombardment. Battery Way, built from 1904 to 1913 at a cost of US$112,969, was named after 2nd Lt. Henry N. Way of the 4th U.S. Artilley who was killed in 1900 during the Philippine-American war. It was armed with four 12-inch mortars capable of firing a 1,000-lb. deck piercing of 700-lb. high explosive shell in any direction with a maximum range of 14,610 yards at the rate of one round per minute per mortar. Three of the serviceable mortars opened fire on April 28, 1942 and on May 2, two of these were hit. After more than 12 hours of continuous firing, the remaining mortar finally froze tight on May 6, the last to cease firing before the surrender. Battery Geary was built from 1907 to 1911 at a cost of US$145,198. It was named in honor of Capt. Woodbridge Geary of the 13th U.S. Infantry who died in 1899 during the Philippine-American War. With a maximum range of 14,610 yards, its eight 12-inch mortars were capable of firing in any direction. Considered as the most effective anti-personnel weapon in Corregidor, the vertical plunging trajectories of the mortars made them ideal for use against enemy entrenched on higher grounds in Bataan. The battery had two mortar pits with 3 magazines and its standard crew consisted of 4 men per mortar. Battery Crockett, one of the 6″disappearing” gun batteries that formed the interlocking field of fire which totally encircled the island, was built from 1905 to 1908 at a cost of US$290,049. Armed with two 12-inch seacoast guns mounted on disappearing carriages behind a concrete parapet, this battery basically fired south across the major southern channel into Manila Bay. It had a range of 17,000 yards and was capable of a 170-degree traverse, with overlapping fields, or a total of 220 degrees coverage for the battery. Similar to Battery Cheney and Battery Wheeler in design, it was centrally located on the island. 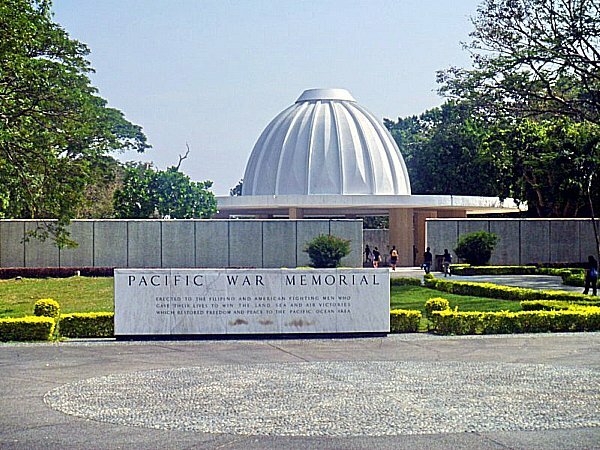 The Pacific War Memorial, standing on the highest part of Corregidor, on the island’s west, was built by the U.S. government and completed in 1948 at the cost of US$ 1,230,000. It is dedicated to the Filipino and American soldiers who shed their blood on Corregidor. The memorial’s dome has an opening at the top through which sunlight shines through to exactly fill a circular altar on the week of May 6, the Fall of Corregidor.Left of the acacia tree-shaded entrance is the Cine Corregidor Ruins and behind it is a small, modest marble museum containing war relics, photos, a documentary film projection room, souvenir shop and descriptive information. To the right of the museum is the remains of the Bachelor Officers’ Quarters and the Post Headquarters. Within the complex is the steel wing-shaped sculpture Eternal Flame designed by Greek-American sculptor Archimedes Demetrius. 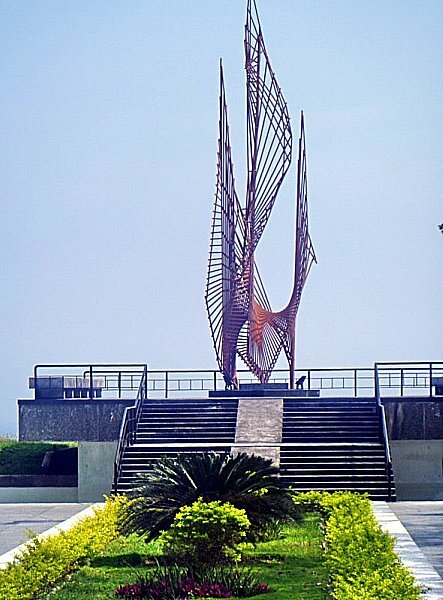 The flagpole, originally a mast of a Spanish warship, was salvaged by Admiral George Dewey after the Battle of Manila Bay, and had it planted in Corregidor. It is where the American flag was lowered during the surrender and raised again during the liberation. The American flag was lowered for the last time on October 12, 1947 and the Philippine flag was hoisted in its stead. Lorcha Dock, situated near Gen. Douglas MacArthur Park (has a life-size bronze statue of the general), is often referred to as The Army Dock or MacArthur’s Dock. It was at this dock where, on March 11, 1942, Gen. Douglas MacArthur boarded PT Boat 41, under the command of Navy Lt. John Bulkeley, for Australia. The Spanish Lighthouse, located on the highest point of the island (628 ft. above sea level), is a reproduction of the old lighthouse built in 1897 but destroyed during World War II. It has a commanding view of the island. We previously visited the lighthouse and the Pacific War Memorial during the Adventour. After the tour, we returned to the hotel for lunch and check out. After lunch, all four of us, together with Jovy and Mat, proceeded to the Mile Long Barracks for additional photo ops and, prior to our leaving, Mark (a first for him) and I tried out the ROCKet Zipline (http://www.benjielayug.com/2009/12/launch-of-the-rocket-zipline-corregidor-cavite.html). a 40-ft. high, 300-m. long free-fall cable ride. Gravity-propelled and with rocket-like speed, it stretches from Corregidor Inn to the South Beach. This piece de resistance truly capped two adrenalin-fulfilling days in the historic, and now adventure-filled, island of Corregidor.